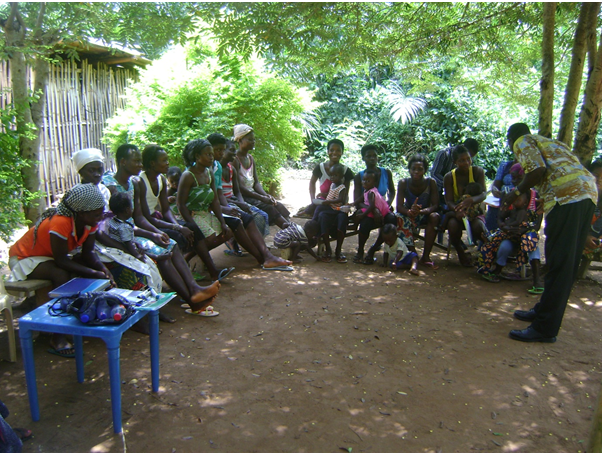 Teenage Mothers of Abenawia, is a group of young women who dropped out of school because of economic difficulties and teenage pregnancy. The men who put them in the family way neglected responsibility for their children. The association was formed on the initiative of Abenawia Child Protection Team in pursuance of a sustainable strategy for community development. The group was formed, first to support these unskilled young women acquire income earning skills to support the education of their children and secondly, to help educate school children against teenage pregnancy. The Association is using practical life experiences (their own experiences) to help girls complete their basic education without drop-ping out of school as a result of pregnancy. What she does for a living is pealing cassava for only GHȻ2.00 (US$0.51) a day. This money is not even paid immediately. It is therefore, very difficult to make ends meet under such circumstance. These teenage mothers go through similar life experiences which are very unbearable, they have therefore come together in a corporative spirit to acquire skills, equipment and other accessories as a group to facilitate a business venture. They appealed to CRRECENT to train them in income earning skills such as soap making, pastries and other skills.